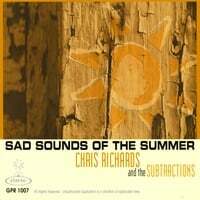 Detroit’s Chris Richards and the Subtractions have released their latest collection of hook-laden, power pop. Richards has been doing this for a long time (since 1989) and the experience shows. The crunchy guitar riffs lead the opening “I Can’t Quit Her” and more sweet melodies and luscious harmonies follow. There is enough rich reverb on the Raspberries-like “Consolation” and heavy rock guitar on “I, Miss July” that it demands repeat listens. Richards has expanded the popularity of the group worldwide, where he explains, “I’ve been fortunate to have my records released and do well in Spain, Sweden, Japan, and Australia and both the press and fan reaction have been amazing. It’s a challenge trying to let fans in multiple countries know we’ve got a record out, but there’s such a great network of the music’s fans out there that word just seems to spread.” Some tracks have a thick jangle texture to them, like “Oh Canada (Part Deux)” and others remove the wall of sound and keep the melodies in the forefront (reminding me of Del Amitri a little) in “Take It From Me.” It’s hard to argue with such good music, but we only have mid-tempo and heavy rockers here (no ballads) if you want to be picky. “I Do Declare” has some great percussion work courtesy of drummer Larry Grodsky and “Beg or Borrow” has an amazing guitar solo ending. Fans of the Posies, Lolas and Tommy Keene will be in pop heaven with this one. Overall, this album is exemplary of the genre, and thus deserves a top ten nod for 2009. Rock and Roll Report Radio Playlist for April 13, 2009 and a Shout Out to the Podcast!